Your school year just got easier! This phonics pack includes all that you need to teach spelling in your 2nd grade bilingual classroom for the year! 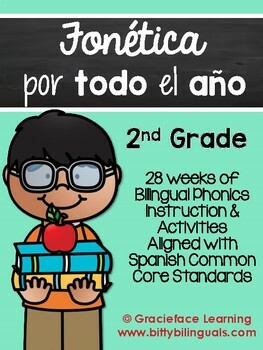 There are phonics lists, worksheets, games, activities, and phonics test paper for each phonics skill included in the Spanish Common Core Standards for 2nd grade! Each week your students will receive a phonics list with 14 words. The first 10 words in each list are for all students. The last 4 words are challenge words. In my classroom I even have students who only study the first 6 words for the week. 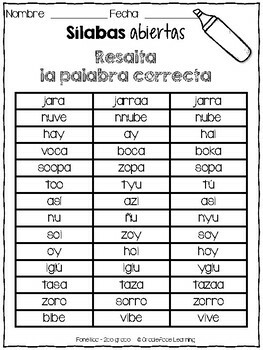 Make these lists work for your students and differentiate! 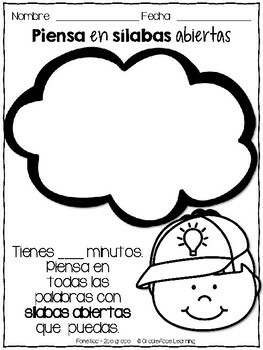 The worksheets, games, activities include all 14 words for the week because regardless of level, students will enjoy working with all words throughout the week. The activities are repetitive each week which helps foster independence in your students. Click on the Preview to see the product in action! Please go to your My Purchases page. Beside each purchase, you'll see a Provide Feedback button. Simply click it and you will be taken to a page where you can give a quick rating and leave a short comment for the product. Each time you give feedback, TPT gives you feedback credits that you use to lower the cost of your future purchases. Your feedback is super important to me as I use it to help me create other products for your classroom!